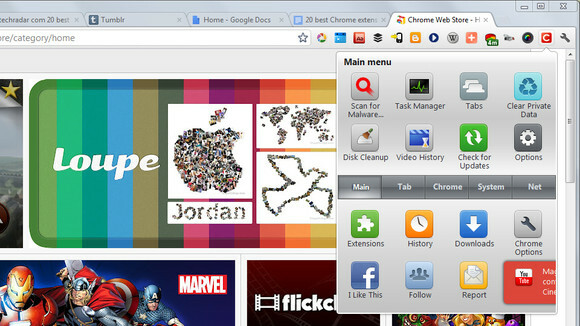 Part of Google Chrome’s appeal lies in its minimal interface, free from stacks of toolbars and rows of icon shortcuts. At the same time, the right extension can improve your Web experience without ruining the browser’s stripped-down style. 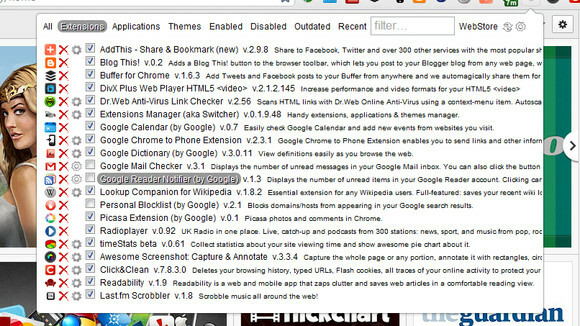 Here we pick out our favourite 20 extensions for Chrome, listed in no particular order of preference. All of these extensions can be found on the Chrome Web Store — bear in mind that you can sync Chrome extensions across multiple machines if you want to, via the Personal Stuff page of the Settings tab. Let us know about your own favourite extensions in the comments below. The best extensions feel like built-in browser features, which is the case with Google Dictionary. Once the extension’s installed, double-click on a word to see an instant pop-up definition (with a link for further information) — find out exactly what “cornucopia” means without interrupting your browsing. Alternatively, you can also look up a word by clicking on the extension icon in the toolbar. If you’re new to Buffer, it spreads out your tweets over a predetermined schedule, so your followers aren’t overloaded. It’s not suitable for time-sensitive tweets (complaining about the latest episode of Homelandperhaps), but it’s perfect for queueing up links and such like. The Chrome extension works flawlessly, composing and buffering your tweet in a couple of mouse clicks. If you’re using an Android phone or tablet, you can use the Chrome to Phone extension to quickly send links and other content to your mobile device, either via the right-click menu or the extension icon. You’ll also need to install the Chrome to Phone app on your Android device, where you can choose whether to open up links automatically. Google has extensions for just about all of its multitude of products and services, but the Google Calendar one is worth a look — not only does it provide an at-a-glance overview of your upcoming events, it can also recognise when a webpage contains an event (such as a Facebook page) and enables you to add the event to your calendar with a single click. Keeping bookmarks and starred tweets is all well and good, but Evernotelets you create a fully fledged interactive scrapbook of all the interesting material you find on the Web. This is one of the official extensions, which enables you to quickly add content to your Evernote account ready for sorting out later. You’ll need to register an account at first. Get past the over-the-top name and Awesome Screenshot is a very useful screenshot tool that manages to be both packed with features and easy to use. It’s possible to add annotations, capture entire webpages (even when they are only partially visible), share pictures quickly via the internet, and more. Images can be saved locally, uploaded or copied to the clipboard as required. If you’re looking for a bigger version of a certain image or want to find out where a picture originated from, then TinEye can help — this reverse image search takes your source picture and looks for other matching instances of it on the Web. There’s no icon added to the Chrome interface, just an extra option on the right-click context menu. Take more control over what your PC and your browser knows about you with Click&Clean — the extension can help you erase your browsing history, edit your privacy settings, remove tabs based by domain, view cached video files, and more. 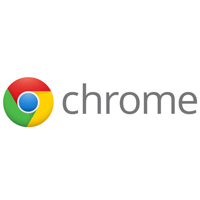 It also links to some of Chrome’s less well-known areas, such as the built-in Task Manager. Tabbed browsing means we’re all surfing the Web faster and more efficiently than ever before, but if you often find yourself lost in a forest of open tabs, use TooManyTabs to better manage them. Get an overview of all open tabs, ‘suspend’ individual tabs for later viewing, search through all of your tabs at once, and more. If you need to download all of the files from a particular page, be they pictures or Zip files, Download Master can lend a hand. 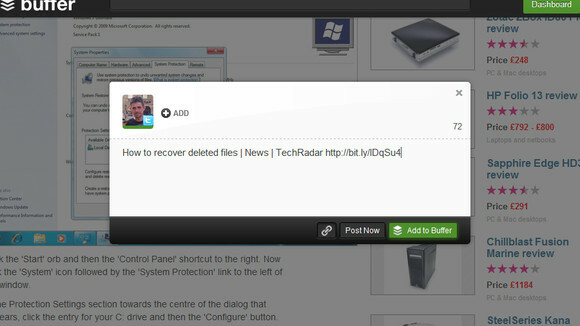 Click the extension icon to see a list of all available links, which you can then filter based on file type or keyword. The downloads themselves are handled by Chrome’s built-in download manager. Banish adverts, sidebar videos and other on-screen junk with Readability — click the extension icon to see a clean, clear version of the article you’re currently viewing. 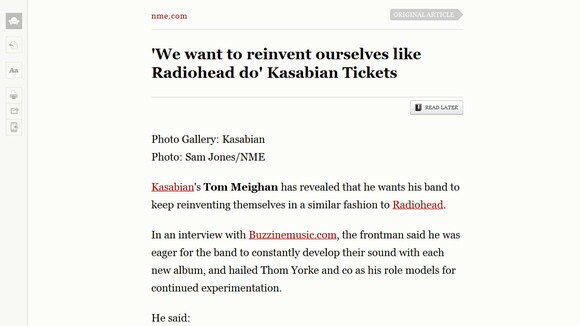 The extension works without a Readability account, though if you sign up for one you can also save articles for later reading. The extension can send articles to your Kindle device too. Gmail is getting better at adding contact info alongside emails, butRapportive is still streets ahead. Pull in data from Twitter, LinkedIn and other social networks to make the right-hand contact pane much more useful. The extension works seamlessly in the background, requires little in the way of configuration and soon feels like a native part of Gmail. Last.fm’s various desktop clients and integrated tools do a decent job of tracking your listening history, but what about the tunes you’re hearing on the wilds of the Web? If you want to log these tracks too, install the Last.fm scrobbler extension, which can pick up songs on YouTube, MySpace, Deezer and many other streaming websites. If you happen to have joined the eReading revolution, then the Send to Kindle extension will definitely be of interest — transfer webpages and articles to your portable device with most of the unwanted extras stripped out along the way. The extension has been tweaked to work well with a wide range of sites, including Wikipedia, Quora, Google Reader, MetaFilter and others. Does a webpage exist if it hasn’t been shared on a social media network? If you’re eager to share your latest online find with as many of your contacts as possible, AddThis makes it easy. It’s tightly integrated with the big two (Facebook and Twitter) and supports many more services besides — it can even work with Gmail and Instapaper. Based around content from Radioplayer, the official UK hub for over 300 online stations, Radioplayer pops up in a new window and lets you listen to the football commentary or enjoy the biggest hits of the 80s while you browse. 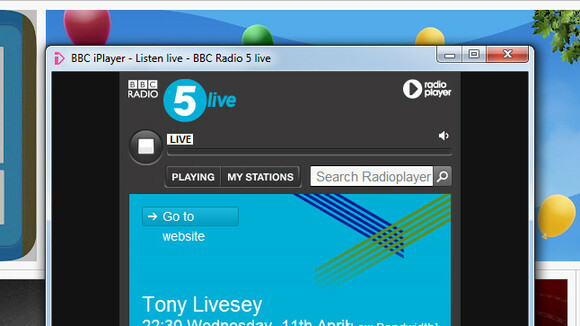 Additional content underneath the playback bar, from information about the current show to further reading on the Web, varies from station to station. Opening a new tab for Wikipedia-ing purposes is old hat — use this streamlined extension instead and avoid having to leave the page you’re on. Recent lookups are saved for future reference, and you can browse forwards and backwards in the extension window, which displays the mobile version of Wikipedia pages to make them as compact as possible. Chrome has plenty of nifty security features built in, but Dr.Web Anti-Virus Link Checker adds another useful one without slowing down the program or your browsing. Once installed, the extension lets you scan links before you visit them, just in case your group of friends and family has a tendency to pass on a lot of virus-filled URLs. Finally, an extension to help you better manage your extensions, as well as the themes and apps you’ve installed within Google Chrome’s walls.Extensions Manager filter through outdated or disabled extensions and toggle their status with a single click, and access the options page for any installed extension. 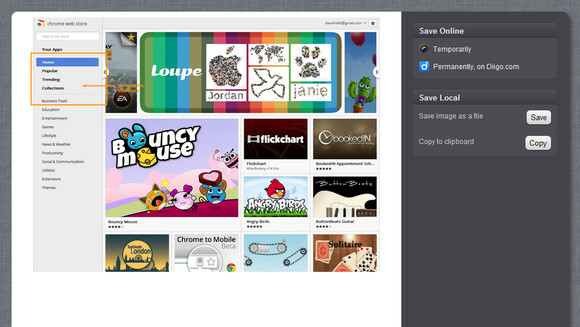 Google would do well to incorporate the ideas here into Chrome itself. Want to know where you’ve spent all your time on the Web? Are you absolutely sure? timeStats beta sits quietly in the toolbar logging everything that you do and then brings up a sleek-looking pie chart visualising just how much time you’ve spent on Twitter. Follow the Additional link to see an even more detailed breakdown of the places you’ve been.